This week was a very special one here in Japan; An unusual combination of public holidays meant three bank holidays back to back. This so-called Silver Week (Golden Week is the famous week-long annual holiday in May) won’t happen again until 2015. Such a special occasion can not go unmarked, of course. 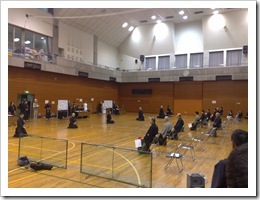 And what better way to do so than with an iaido competition. So it was that last Tuesday your humble scribe packed dougi and katana and made the arduous journey one stop down the Chuo line to Ogikubo for a day of competitive swishing. As regular readers will know, iaido is the art of Japanese swordsmanship that studies the quick draw of the blade, a swift and efficient despatch of the opponent and the replacement of the sword back in the scabbard with grace and dignity. It is very closely linked to kendo, but because we use real swords rather than bamboo ones, direct competition is – of course – impossible. You’d run out of players pretty quickly and the hall would get terribly messy. Instead, the players compete against each other in front of a stern panel of judges to see who can perform specific set-piece techniques with the greatest degree of technical skill and controlled fighting spirit. Like many things Japanese, it looks easy. It isn’t. The techniques are physically challenging – especially for westerners with our longer arms and legs. The sword itself (for those that use a “live” blade) is very,very dangerous and easily capable of removing a thumb or finger in an instant. The degree of skill required just to cut properly with a Japanese sword takes years to master, and the attention to detail within the techniques themselves is extraordinary. A foot 1cm out of place or an eye-movement in the wrong direction is often all that separates the winner from the loser. 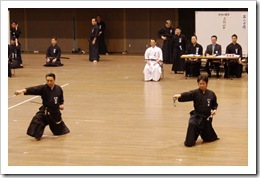 There is also a lot of formal etiquette, reiho, that forms an integral part of the demonstration and this too is extremely detailed and difficult to master. Everything has to be performed technically perfectly, but also with a demeanour that demonstrates a Zen-like calm and mental focus. All accomplished under the withering eyes of three judges, who are all 6th dan or above (most are 7th or 8th dan). Believe me when I say, demonstrating under these conditions is extremely stressful. I have never liked competitions much, but they are a very necessary part of iaido training because they add the “combat stress” element to your studies. There’s no other way of safely pressuring yourself to see whether you can control yourself well enough to perform good technique in challenging circumstances. I have competed in the UK nationals a few times, but the prospect of actually competing in Japan was quite a daunting one. Nevertheless, encouraged by my teacher and fellow students, I took part in a competition in the Tokyo Budokan earlier this year. The experience was scary, but exciting and, having done so, I felt very much part of the scene here, rather than just a visiting foreigner dabbling in martial arts. So, I was not completely new to the situation when I took the court on Tuesday. I’d practiced my five kata fairly diligently and was feeling reasonably confident. Plus the fact – I was wearing my new lucky Union Jack boxer shorts under my hakama (thanks mum!). After walking forward and being given the command hajime (begin) I took the seated position and began my embu (demonstration). My first technique involves rising from a kneeing position whilst drawing the sword and cutting the opponent across the eyes before finishing him off with a large vertical cut. My cut felt very weak compared to how I’d practiced it, and my heart sank a bit because I realised it wasn’t going to be my best performance. Nevertheless, I got a grip of myself and resolved to try and at least acquit myself well for the rest of the demonstration. After finishing and performing the end etiquette, the lead judge rose with flags in hand. All the judges carry a white flag in their left hand and a red in their right to indicate which demonstration was the best. On the command, the judges raised their flags – bugger me, three red flags…I’d won! True, I went out in the next round having drawn the guy that eventually won it, but for me I was very pleased to have taken my first step towards the Japanese silverware. I’ll be competing in another contest this weekend in Tama. Maybe this time my luck will hold through to the third round? Maybe not…this competition is much bigger so I don’t hold out much hope of success. But – as we British so rightly say, it’s not the winning but the taking part that counts. Even in distant lands, how true that is.